One of the most acclaimed divers in Miami history. A 4-time NCAA diving champion and an ELEVEN time All-American. Tyce was recruited from Southern California's El Toro High School as the Div. 1 CIF Champion and a nominee for the Dial Award for the nation's top student-athletes. He was recruited as part of a trio of freshman that would become a powerhouse in NCAA Diving. As a Freshman at the 1995 NCAA Championships he would place 3rd on 3-meter and would win his first NCAA Title for the 10- meter platform. The freshman trio, that included Bryan Gillooly and Chris Mantilla, would sweep the event and make NCAA history as the first school to sweep a diving event. In 1996, he placed 6th in one-meter, 3rd in 3-meter and 2nd in 10-meter behind his UM teammate Gillooly. The trio would sweep two events and earn an eighth place NCAA Team finish, the best NCAA showing in school history. At the 1997 BIG EAST Championship he placed 2nd on 3-meter. He reclaimed his NCAA title in 1997 for 10-meter platform and added another NCAA title in the 3-meter event. 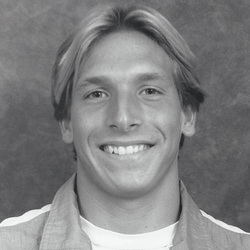 Two NCAA championships, and a 3rd place in 1- meter, would earn him honors as the 1997 NCAA Diver of the Year. At the 1997 US Senior Indoor Nationals in Auburn he placed 3rd in 10 meter and 5th in 3 meter. The next two years were dedicated to church service in Buenos Aires, Argentina where he was able to teach English, and help rebuild after disasters. After two years without training and an early injury his senior year in 2000 he battled back and reclaimed the crown of 10-meter NCAA Champion for his fourth NCAA title. No other diver to date has won 3 NCAA titles for the 10- meter event. Tyce was an All-American in the 1-meter, 3-meter and platform his final 3 seasons, plus in the 3-meter and platform as a freshmen for an unprecedented ELEVEN All-American honors! He was a member of the US National Team from 1994 to 1997 and competed internationally at the top level in the 10-meter Platform and Springboard events. He was a finalist in the US Diving Olympic Trials in 1996 and 2000 with a best place finish of 6th. Tyce graduated from UM with a degree in Business Administration and majored in International Finance and Marketing. After retiring from diving in 2000, he assisted in coaching the nationally known Mission Viejo Nadadores age group team in Southern California from where he originated. He helped other athletes reach their goals to compete at the collegiate level. He graduated Miami with a Bachelor of Business Administration degree (BBA '01) , and currently resides in Gilbert, AZ with his wife Allison and their three daughters.